Update: The National Weather Service has added fire weather zone 493 — the central Utah mountains — to the red flag fire weather warning issued Friday. The warning is in effect from noon Saturday until 8 p.m. Sunday. ST. GEORGE — Incoming strong winds and low humidity are expected in Southern Utah this weekend, combining to make the region vulnerable to new wildfires and rapid fire growth. In the meantime, the Saddle Fire that began in the Pine Valley Mountain Wilderness mid-June is largely contained and fire management is expected to transfer to local agencies Saturday. A red flag warning by the National Weather Service has been issued for these regions from noon Saturday until 8 p.m. Sunday. 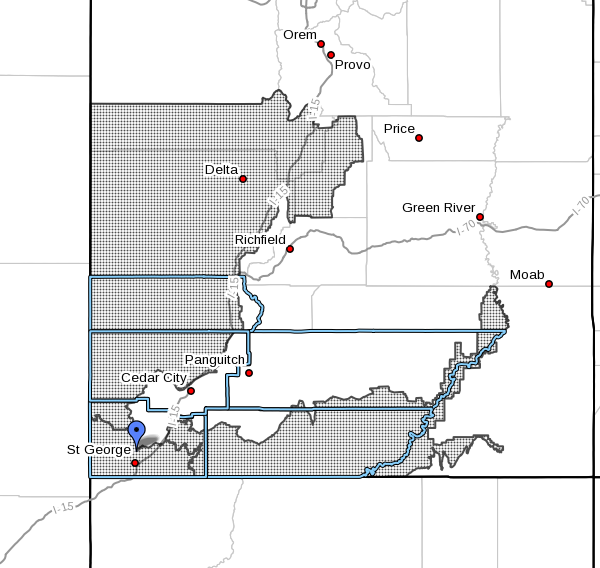 Areas subject to the weather service’s red flag warning include fire weather zone 492, central Utah’s west desert; fire weather zone 495, Color Country’s west desert; fire weather zone 497, Mojave Desert; and fire weather zone 498, Grand Staircase. Southwest winds of 15-25 mph with occasional stronger gusts are expected to develop Saturday afternoon, drop off Saturday night and then redevelop Sunday. Relative humidity on Saturday afternoon will be between 5-10 percent, rising to 15-30 percent Saturday night. As of Friday morning, a warm, dry air mass remains over the Saddle Fire in the Pine Valley Mountain Wilderness area of Dixie National Forest. No moisture is forecast for the coming week. The fire was started by lightning June 13 and covers 2,298 acres Friday with 72 percent containment. Fire managers plan to transition from Type 3 incident management to local unit management Saturday. Fire activity within fire control lines remains south of Lloyd’s Canyon. Smoke will be visible for several days. A temporary flight restriction is in place over the Saddle Fire area. Except for agency firefighting aircraft, all aircraft is restricted from the fire area to provide for fire fighter and public safety. This includes unmanned aircraft systems or drones. While people cannot affect the weather, there are a number of things they can do in their everyday and outdoor activities that can prevent human-caused fires. Check and secure chain chains on vehicles, trucks, trailers and the like for both on-road and off-highway use to be sure they don’t drag and hit the ground. Chains against the ground cause sparks that ignite wildfires. Enjoy campfires in permitted areas only, and be sure they are cold to the touch before leaving them. Stir the dirt with water until it is cold. Heed fire restrictions that are in place – read more here. Be aware of your surroundings when target shooting and avoid areas with cheatgrass and dry fuels. Don’t smoke in fire risk areas except within an enclosed vehicle, camp trailer, building, developed recreation site or while stopped in an area at least 6 feet in diameter that is barren or cleared to mineral soil. Don’t weld, cut or grind metal in fire risk areas. Use fireworks only where permissible in your region. Fireworks safety includes being mindful of your surroundings; not using them near vegetated areas or where you could start structural fires; and putting spent fireworks into a bucket of water, not in a trashcan. If a firework does not ignite, leave it alone – don’t try to reignite it. Have a bucket of water or fire extinguisher nearby as well as a shovel before starting your fireworks.